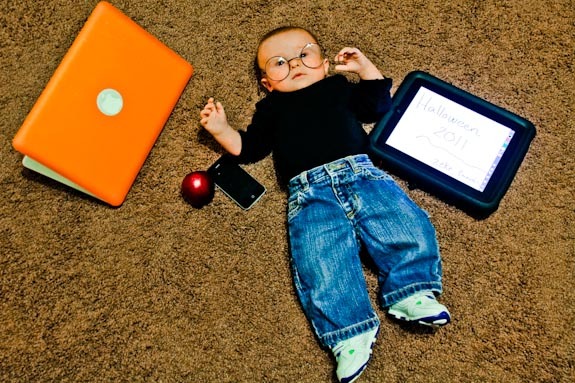 A few weeks back, after the passing of Steve Jobs – I knew little Zeke would have to be a baby Steve Jobs for Halloween. Steve Jobs was a brilliant innovator who left this Earth way too soon. If you are looking for a geek costume for baby or perhaps a super simple DIY costume, why not dress your baby up as the ultimate Apple genius. So how do you put together a Steve Jobs Costume? It’s super easy and very affordable. Well, affordable – minus the Apple products, of course. Today, my dear friend Mary Graham posted a link to Steve Jobs eulogy – written by his sister, Mona Simpson. When you have a few minutes, give it a good read. The piece is so touching and gives an inside look to the Steve Jobs no one knew. So in addition to being a brilliant genius and head honcho at Apple – Steve Jobs was a good man, wonderful father, a devoted husband and a loving brother. All of which I hope my little Zeke (and other boys!) will grow up to be. I totally love that you dressed him as a baby Steve Jobs. Too cute!!! Thanks Laura! We had fun with it!